Mick Lally 1945-2010 R.I.P. | What I think About When I Think About Writing. One of Ireland’s most beloved character actors died today. 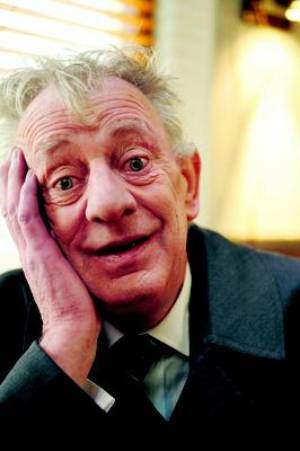 Mick Lally, known to many of us as Miley in the long-running soap Glenroe, passed away peacefully in hospital this morning. He was 64. Lally began his career as a teacher and secured a part in the premiere of Brian Friel’s play Translations in 1980 while a member of the Field Day Theatre. Company. His work on television in the RTÉ series Bracken and later his role as Miley in Glenroe made him a household name. He also starred in the BBC television series, Ballykissangel, and in the award-winning Ballroom of Romance. Lally’s versatility as an actor extended to the cinema where he appeared in Irish language films. He was a fluent Irish speaker and an advocate of the language. Lally also starred in Hollywood-funded films including Alexander, directed by Oliver Stone, and provided the voice in the animated film The Secret of Kells. He is survived by his wife Peggy and their three children. This entry was posted in Uncategorized and tagged Actor, Arts, Ballykissangel, Brian Friel, Glenroe, Mick Lally, Performing Arts, Television program, The Secret of Kells, Theatre. Bookmark the permalink. A great reminder . . . LIVE TODAY for tomorrow we die. Last night, we watched LEAP YEAR set in Boston and Ireland! Lovely scenery. Have you ever been to Dingle? Not yet, but it’s certainly on my list of places to visit.